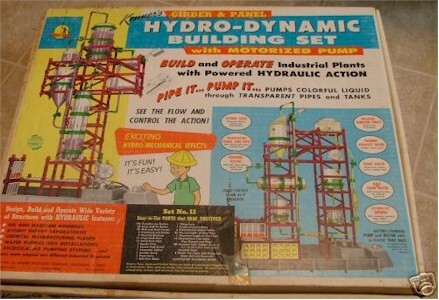 If anybody has a Kenner Hydro-Dynamics kit they would like to part with, or they spot one somewhere, please let me know. I have been searching for a replacement for some time. PS I actually got my nickname after a model rocket I built flew into our neighbours shed and exploded. This is great. My dad got me one of these for Christmas when I was 11 along with the Girder and Panel set from Kenner. He knew I had a leaning toward engineering from the Christmas prior to that when I was upset my older brother got the erector set and I got a bycycle. As it turned out, I am now retired having spent 40 years in engineering at Honeywell, Marconi, MCI and a Finish company called Kone. Sadly, they don't make toys like this anymore. I got a set I think in 1962 for christmas. It was a great toy and gave me experience on how liquid moved and could be pumped. I ended up working on irrigation projects at a state university. I wish I had the set today but ended up using the pumps and tanks to make a working submarine. I have 3 of these No. 11 Kenner Hydro-Dynamic sets along with 2 of the No. 12 Double Pump sets. All of my sets pump water without any problems. They are a lot of fun and make me feel like a kid again. Wow! I don't recall this one at all. Wish I'd have had this to go with my other Girders and Panels. Bet I'd have loved it.